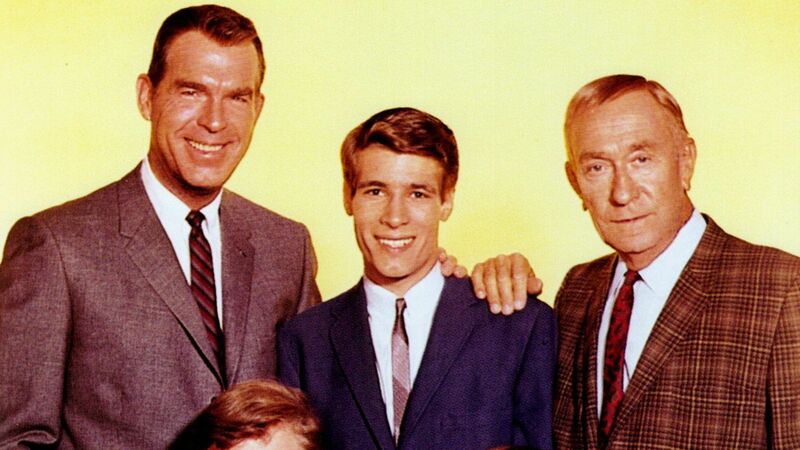 Here's where to watch every episode of My Three Sons season 8. Mouseover or tap an episode to see where to stream it. Click or tap the play icon to stream it on the best available service. Moving Day Sep 9, 1967 The Douglases move to California, where at first they are depressed to find the residents as chilly as the weather is warm. Robbie enrols in the University and is totally captivated by a blonde girl, and Uncle Charley is initiated into the rapid-fire procedure of shopping in supermarkets. The family begins to feel that their next door neighbors represent the characteristic stand-offishness of all Californians until they discover that they moved into the neighborhood the day before they did. Robbie Loves Katie Sep 16, 1967 After advice from his father who tells him it isn't right to tie himself down to one girl, Robbie Douglas, intending to break off his romance with Katie Miller, ends up proposing to her. Soon his heart over rules his head and he buys an engagement ring and sets a wedding date. Inspection of the Groom Sep 23, 1967 Robbie and Katie pick a wedding date two weeks off. Katie's sorority sisters decide to do some private investigating on their own. Prospective groom Robbie then undergoes the complete once-over by his fiancee's family and runs the gamut of numerous cousins, aunts and a crotchety grandmother. Countdown to Marriage Sep 30, 1967 The day before her wedding Katie Miller feels she faces complete disaster. When Robbie tries to console her, she flares up at him and after a short argument, the pair declare the wedding is off. Of course, Grandma Collins thinks otherwise. Wedding Bells Oct 7, 1967 Early on his wedding day, Robbie Douglas and his family are peacefully oversleeping. They awaken just in time and scramble madly to get ready as Robbie and Katie are soon married amid traditional confusion and tears. The lost family dog, Tramp, returns in time to join the family in the front pew. The Homecoming Oct 14, 1967 Robbie and Katie come home from their honeymoon to face the problems of newlyweds in a previously all-male household. Katie finds her role difficult, for Charley insists on continuing as the family cook and attending to all the laundry. Robbie becomes worried about her frequent weeping spells. My Wife, the Waitress Oct 21, 1967 For their fourth week wedding anniversary, Katie decides to earn some money for an expensive gift for Robbie by taking a one week job as a tea-room waitress. Robbie lunches at the tea-room and finds Katie, who has taken over as a last-minute replacement for the cigarette girl, in an abbreviated costume. The Computer Picnic Nov 25, 1967 Chip manages to outwit the machine age when a computer is used to select partners for picnic dates for the boys in his class and girls from another school. He is soon startled to find that his date, although sweet and likeable, is six feet tall. The Chameleon Oct 28, 1967 At school, Ernie meets Mike, who offers to play with him, but the family is exasperated to know Mike likes tomboyish pranks. Then there's a problem persuading Ernie to accept his new friend when he learns that she's really a girl. Designing Woman Nov 4, 1967 Attractive lady engineer Eileen Talbot is assigned to help Steve Douglas on a rush project in his office, and she applies her many talents to assure romantic, as well as technical success. Only level headed Katie recognizes her as a manipulating female long before the gullible male Douglases do. Ernie, the Bluebeard Nov 11, 1967 Chip learns the meaning of empathy when he helps Ernie out of a predicament when he somehow winds up with two dates with two different girls for the same dance, when he doesn't even like girls to start with. The Heartbeat Nov 18, 1967 One stormy night while Steve is in San Francisco, Katie is alone in the Douglas house while the rest of the family is attending a ballgame. Her tenseness builds as late in the night she hears a scary rythmic noise, and hysterically calls Steve to report that the family has not yet returned and that she hears a loud thumping sound. The Aunt Who Came to Dinner Dec 2, 1967 Katie is worried when Steve invites her visiting Aunt to spend a week at the house while he is out of town. Before long, she is molding the entire household into her image of a cultured family. When she slips some money under Katie's pillow, the girl angrily announces that this behaviour cannot continue. Liverpool Saga Dec 23, 1967 Chip invites his neighbour's long-haired, guitar playing boy from Liverpool as a key addition to his off-key rock and roll band. The English lad's soft, folksong guitar is a disappointment and obviously won't work with the raucous amplified trio, but he helps them to win a trophy in an amateur talent contest. Leaving the Nest Dec 9, 1967 When minor irritations arise in the Douglas household, Robbie and Katie move temporarily into a borrowed apartment while their friends are away. Their life is complicated by the absence of a coffee pot, a pull-down bed that won't go up and the lack of a television set. You're Driving Me Crazy Dec 16, 1967 Chip Douglas is so nervous about taking his driving test that his new sister in law Katie decides to help by taking the test with him. Soon after they both get their driving licenses the family car collects a big scratch, but neither will plead guilty. The Chaperones Dec 30, 1967 With his father Steve busy over the weekend, Chip suggests that newlyweds Robbie and Katie act as chaperones to him and his friends at a mountain cabin. At Katie's insistence, Robbie keeps strict checks on the three teenage couples. Green-Eyed Robbie Jan 6, 1968 Robbie Douglas displays a bit of jealousy when his bride innocently agrees to tutor a handsome student. Later, Katie confides to Uncle Charley that he was once her steady boyfriend, and Charley off-handedly warns Katie to be careful because Robbie has a jealous nature. Charley's Tea Jan 13, 1968 Katie tearfully complains when Uncle Charley makes her feel unnecessary in the Douglas household. Steve speaks to Charley who is flabbergasted at the accusation, but immediately makes amends. Meanwhile, Chip is on a five-man school committee; four of the 'men' are girls and they won't let him open his mouth. Ernie, the Jinx Jan 20, 1968 A series of strange coincidences make young Ernie feel he's a jinx to anyone he contacts, but his father assures him that he has a loyal family who loves him in spite all of his trouble, and that they will stick by him no matter what. Ernie and Zsa Zsa Jan 27, 1968 Bored because he has been left at home alone on a day off from school, Ernie goes on a search for movie stars. The boy loses his footing on a steep path and falls into Zsa Zsa Gabor's swimming pool in Beverly Hills. The glamorous lady invites him in until his clothes dry and later takes him to a real movie studio. Now the whole family as well as the police are searching for Ernie. A Horse for Uncle Charley Feb 3, 1968 Uncle Charley is talked into buying an 11 year old trotting horse in the hopes of capturing old racing glories. The family is delighted when they hear that the horse, driven by Uncle Charley, has qualified for a race after winning a trial competition. Dear Enemy Feb 10, 1968 Robbie goes to Camp Roberts for two weeks military reserve training. At home, Steve becomes alarmed when he sees Charley's card telling him that he and the boys who are camping at Yosemite, plan to look Robbie up at camp. But he arrives too late to divert them and one-by-one each member of the family is inadvertently caught as a military prisoner. Uncle Charley's Aunt Feb 17, 1968 Dressed as a chorine named Apple Annie at his Lodge 'Frolics' night, a weary Uncle Charley awakens from a nap after a matinee performance and is forced to walk home and is arrested by the police for hitting a flirtatious man. The Standing-Still Tour Feb 24, 1968 Ernie remains at home with Uncle Charley while the rest of the family travel to various locations. Charley invites an old friend to dinner, believing him to be down and out. However, Ernie immediately identifies their guest as a famous television sherriff and he invites the two to the studio. Honorable Guest Mar 2, 1968 The Douglas family cancels a camping trip to play host to unexpected Chinese friends from Bryant Park who are en route to Hong Kong and this ultimately upsets their Chinese relatives when they are asked to stay overnight. The Perfect Separation Mar 9, 1968 The first time Robbie and Katie entertain at home they imperil the marriage of two close friends, Denise and Larry. Denise insists on playing a game in which each player tells what he dislikes about the other. After various uncomfortable truths are revealed, Denise angrily storms out insisting on a marital separation. Gossip, Incorporated Mar 16, 1968 Steve Douglas is promoted to head up the Airflight Helicopter Division and the unmarried female employees quickly check and discover that he's a widower. Robbie's wife Katie takes a tour and Uncle Charley passes his girlfriend off as Steve's wife. When two Mrs. Douglases visit Steve at his new job, his employees suspect that he's a bigamist. The Masculine Mystique Mar 23, 1968 Uncle Charley persists in singing an old song about a guy who steals his best friend's girl. Chip listens with some sorrow but there is a misunderstanding that almost ruins the friendship between Ernie and his pal when Shorty sees Ernie walking to the movies with a new girl in the neighborhood. The Tire Thief Mar 30, 1968 Ernie and his friends sell two used tires they found in the family storage room so they can buy a water rifle, but they cease to enjoy their 'cops and robbers' games when the real cops turn up after Uncle Charley calls them.